Dreamers and supporters of the DREAM Act march in protest to the repeal of DACA at the University of Texas Rio Grande Valley on Nov. 9, 2017, in Edinburg. 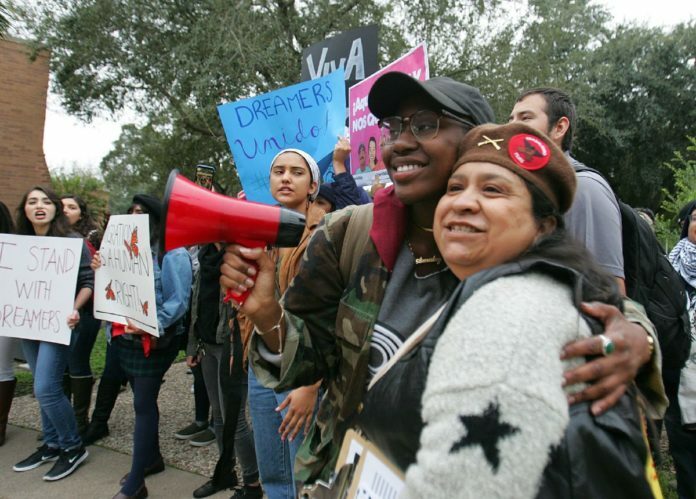 A federal judge in Houston has ruled that the State of Texas can’t end Deferred Action for Childhood Arrivals, which is good news not only for Texans directly and indirectly affected, but also for the economy. I was directly involved in the matter and gave testimony regarding the economic effects of DACA. DACA was implemented in August 2012 and allows immigrants who entered the United States as children to remain here for school or work under certain conditions. Nearly 700,000 people across the U.S. are enrolled in DACA, with about 114,000 of them residing in Texas. Hundreds of thousands of individuals are eligible but haven’t yet enrolled. To qualify, applicants must be in school or have at least finished high school and can’t have been convicted of a significant crime. Many have gone on to college or other training, and more than 90 percent are employed according to a recent survey by the Center for American Progress. DACA recipients are an important source of labor, particularly with the U.S. economy at or near full employment. It is becoming increasingly difficult for employers to fill open positions, and labor shortages are emerging in many industries and geographic areas. Without enough workers, overall economic growth can be constrained as companies have difficulties expanding to meet demand. Many studies, including my own, have shown that undocumented immigrants have a net positive effect on the Texas economy and state and local governments. Looking specifically at DACA recipients, my firm estimated that for the United States, direct benefits of DACA recipients include $84.3 billion in annual output (gross product) and nearly 685,200 jobs. When multiplier effects are considered, the total benefits rise to $188.6 billion in annual output and nearly 2.1 million jobs. For Texas, the direct gains in business activity associated with DACA recipients include an estimated $11.5 billion in output each year and 108,100 jobs. When multiplier effects are included, the total rises to $25.8 billion in annual output and 324,000 jobs. Clearly, keeping DACA in place is good for the economy. With the aging of the U.S. population, the potential for shortages stands to worsen, and immigrants will form an increasingly crucial element of the workforce. Although the recent ruling prevented an abrupt end to DACA, the judge also pointed out that the program may not be on firm legal footing, and future litigation is likely. Congress should find a permanent solution to this and other immigration issues that protects borders but allows use of the foreign workforce, not only because it’s the right thing to do, but also because it allows the economy to utilize this much-needed resource more efficiently to sustain future growth.